I know what you might be thinking, really 3 pizza recipes in a week? Yes I just had to! Last Friday I shared a Sweet Potato Marshmallow Pizza and mentioned how it wasn’t the pizza I really wanted to share because the one I really wanted to share didn’t photograph well. Well I attempted to photograph it again and it turned out a little better. I shot a couple hundred pictures until the pizza stopped steaming at which point I called it and had to dig into the pizza because it’s so good! Well the photos turned out pretty good and I couldn’t wait to share this with you. Don’t worry it will probably be a few weeks, or more, before you see another pizza post. As I my have mentioned a couple of times I’m really feeling cranberries this year! I’ve always liked cranberries always making extra cranberry sauce during the holidays so I can have them in the days after with yogurt, muesli, oatmeal, ect. This year is just different because while I like cranberries I’m not usually this crazy about them, and usually make a lot more pumpkin flavored creations. Maybe it was the cranberry festival I attended last month and the fruit drawer full of over 10 pounds of fresh cranberries with even more frozen in the freezer. Or maybe not and I’m just loving this superfood berry more than pumpkin since my tastes are changing with age. Haha! No matter what the reason I’m rolling with it! 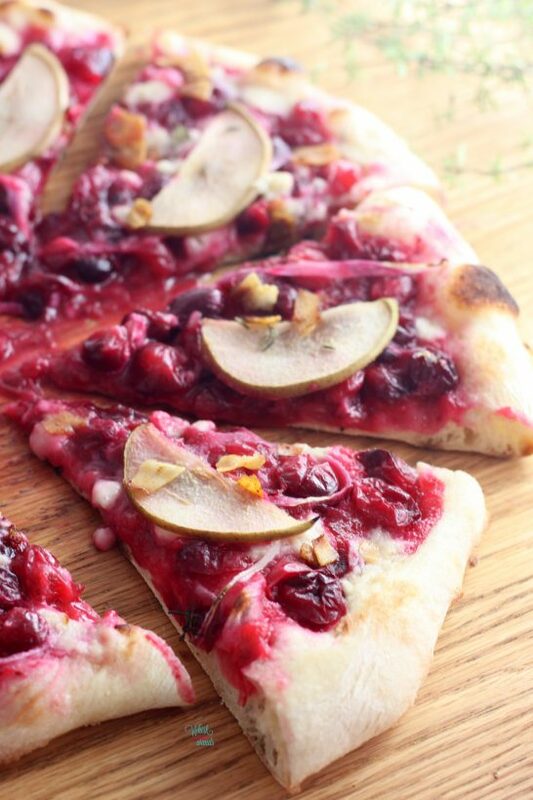 With a list of a dozen cranberry creations to play with and make you had to know that a pizza would be at the top of the list with our weekly pizza night! Although today is Friday and we won’t be making pizza, but A and I will be going out to get pizza tonight since it’s a girls night and she picked a pizza place for her and me to have dinner at tonight. I let her pick since her birthday is this weekend. This pizza is the perfect combination of sweet, savory, and tart! I wish I hosted Thanksgiving because this would be on the menu and I’d be one happy girl! A quick cooking cranberry sauce paired with fresh creamy (vegan) mozzarella, topped with pear slices, red onions, and finished off with fresh thyme and optional coconut bacon. The coconut bacon adds a little texture and salty savoriness! 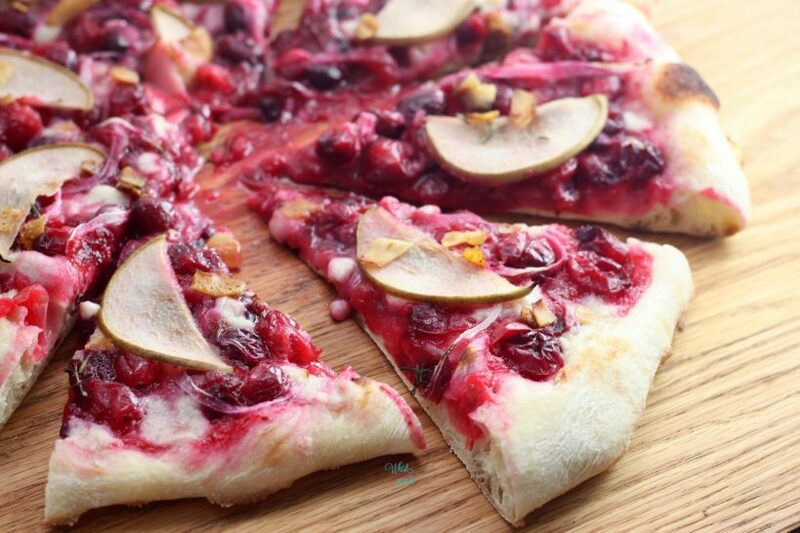 If you’re thinking dessert pizza no this isn’t a sweet dessert pizza but more like a sweet and savory salad that’s made with cranberries, you wouldn’t want that for dessert and this is far from a sweet dessert pizza! 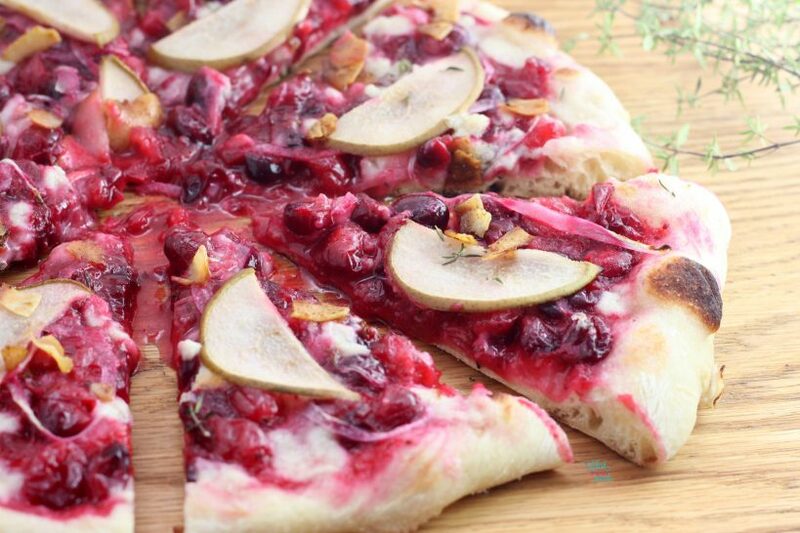 Now if you’re one who loves pizza and are looking for a reason to enjoy it, not that you really need one, this pizza is packed with the superfood benefits of cranberries! Cranberries have vitamin C and fiber, and disease-fighting antioxidants, cranberries outrank almost every fruit and vegetable. Cranberries are rich in a wide range of phytonutrients. Phytonutrients have been found to prevent cancers such as breast, colon, lung and prostate; lower inflammation; protect against heart disease; lower cholesterol levels; and protect cells from damage. 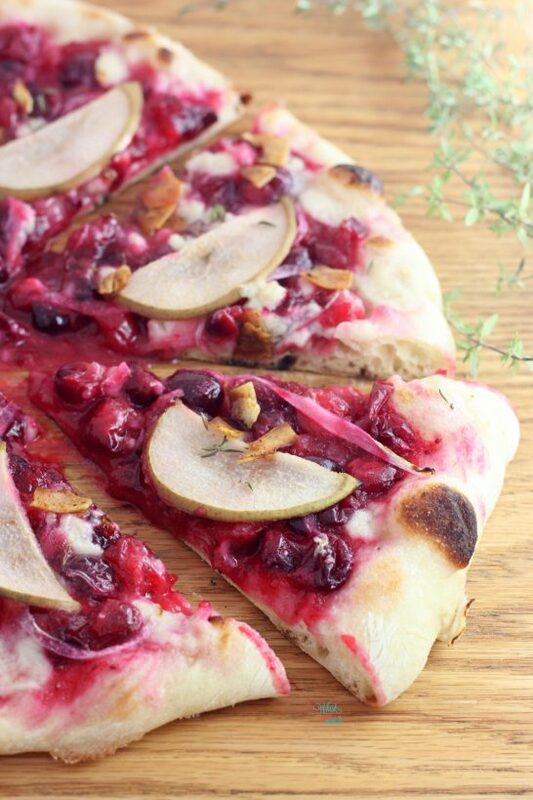 So why enjoy a healthy Cranberry Pear Pizza? Bring cranberries, maple syrup, sea salt and water to a boil. Turn to medium and simmer 5 minutes with the lid on. Remove from heat, stir and let sit to cool. Heat grill or oven, with pizza stone placed inside, to 550F if using my husband’s crust recipe otherwise heat per your pizza crust directions. Using a slotted spoon (leaving the leftover liquid as it doesn’t work well with some of the other pizza crusts) spread the cooled cranberry sauce on the pizza crust as you would a pizza sauce. Next take your mozzarella and sprinkle pieces over top. Top with onion and pear slices. Place pizza, keeping it on the parchment as it will easily slide on and off your pizza stone, onto the pizza stone. Check at 8 minutes, the crust should start to be golden brown and slightly blackened on the outer edges like a traditional Neapolitan pizza. If using your own crust bake per your crusts instructions. Remove pizza, sliding a baking sheet under the parchment paper. Top with fresh thyme and optional coconut bacon. Serve with balsamic vinegar, optional. Enjoy! 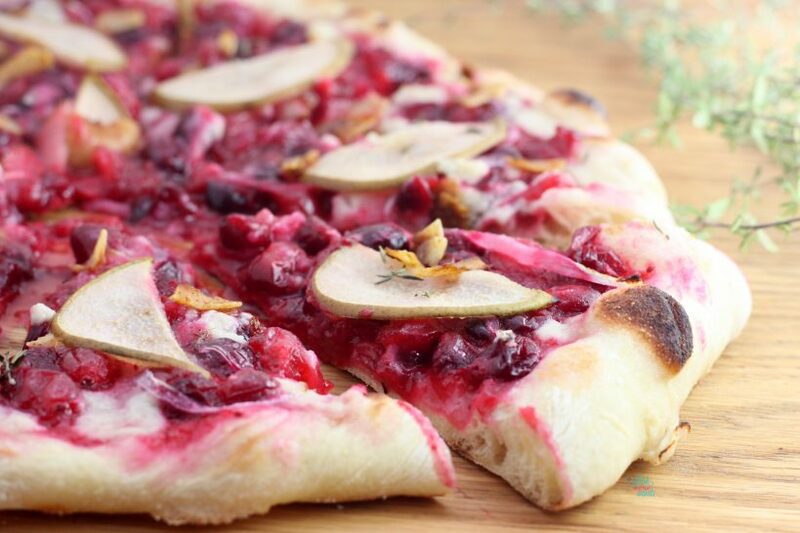 Flavorful fall Neapolitan crust pizza packed with antioxidant rich cranberries, pears, creamy (vegan) mozzarella, and optional coconut bacon! What a yummy looking pizza that is! I’d totally whip that up to serve as a Thanksgiving, Christmas or even NYE appetizer! I am all over pears right now and this looks amazing! I think….you are the pizza queen. You come up with such great combinations! I’m all aboard the cranberry train right along with you – lovin’ them this time of year. Can’t wait to try this pizza; looks like something the whole family will love! Chrissy @ Snacking in Sneakers recently posted…How runners can fit in more strength training + nutrition tips for your workouts! Love the unique take on pizza. I bet it’d be all the rage at a party! I like that this is a combination of savory fruit and sweet fruit flavors. It’s perfect for Fall and aesthetically it knocks your socks off. It’s Gorgeous! Another creative pizza recipe! Those cranberries have come out in such unique ways, and I LOVE that! I need to get some in my house ASAP and start following up with all your recipes! I loooove cranberries! I think my husband would really enjoy this recipe. How creative is this?! Saving it for Thanksgiving…might make a fun app! Yummm! Perfect as these holidays come around! So unique! This Is such a creative pizza idea! Perfect for fall! 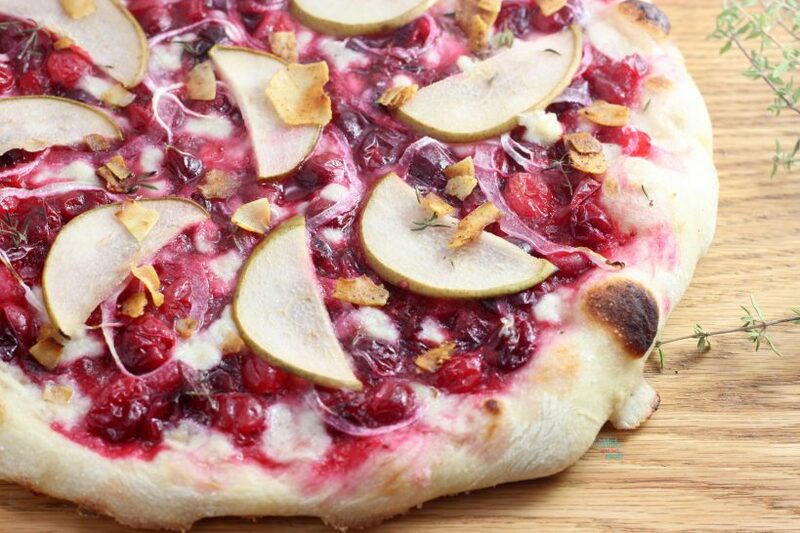 Wow – what a great pizza for fall! Looks amazing! Ilka recently posted…Sunday Fitness & Food Link-Up – Welcome back! This is such a fun and no doubt tasty idea Sarah! I’m betting this recipe would be a great use of leftover homemade cranberry sauce, too!